Photograph from an original painting of Colonel William (Billy) Stephen Hamilton, M. Smith Photography in Poughkeepsie, N.Y. 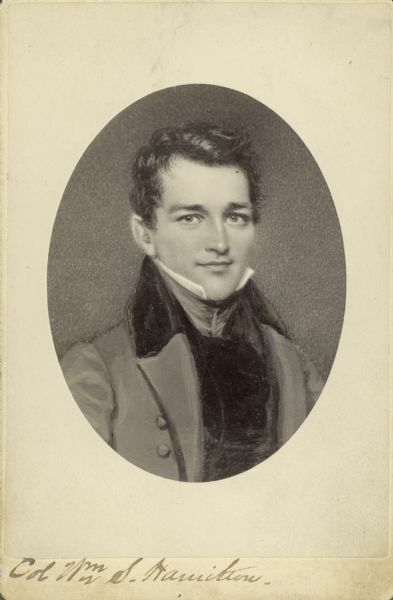 Son of Revolutionary War hero and former Secretary of the Treasury, Alexander Hamilton. Billy Hamilton served as a member of Wisconsin's Territorial Legislature, fought in the Black Hawk War and owned a lead mine near present day Wiota. Information on the acquisition of this photograph can be found in the archives in SC 1847. The photograph was created ca. 1880, but the original painting dates from much earlier in the 19th century.